Norwegian local post stamps have most recently been cataloged in 2005; the catalog is available from me. The 2005 numbers are often different from the 1963 Pihl numbers, but many people still use the 1963 numbering which was the previous standard reference. Condition standards for locals are not the same as for regular stamps. In some issues thins are the norm. In general, defects that affect the value or appearance of the stamps will be mentioned. As always, all items are guaranteed, as is your satisfaction. Norwegian Missionary in Madagascar (Madagaskar) Local Post Stamps: NH VF reproduction souvenir sheet of 16 stamps, crudely printed to resemble the original 1894-1896 local post stamps. Each of the original four stamp designs / denominations is represented by four examples; each example has small differences (the originals were printed from crudely set hand-set type). 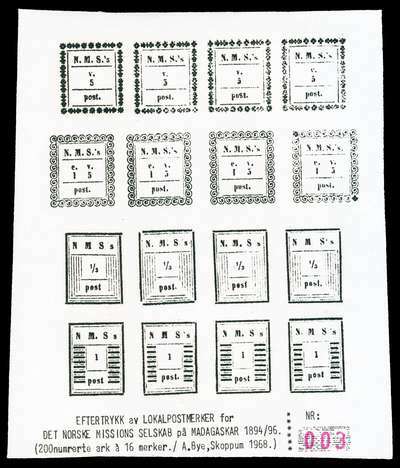 The souvenir sheet, created by Norwegian philatelist Arne Bye in 1968 with only 200 souvenir sheets printed, states that these are "eftertrykk" (after-prints), but might be more appropriately termed photographic reproductions. With the original stamps (which are listed in the specialized catalogs) valued at hundreds of dollars each, this s/s of 16 stamps is as close as most collectors will get to owning examples. Each s/s is numbered; the placement on the paper and size of margins will vary (these were hand cut). These are rarely offered, but over the years, I have seen them sell -- and have sold them myself -- for over $100 in online auctions (when I have offered them, I have never started them for more than $50).